The Pz.Kpfw. III Ausf. J1 (Panzer III J1) is a Rank II German medium tank with a battle rating of 3.0 (AB/RB/SB). It was introduced in Update 1.43. An improvement over the J version with the longer 50 mm KwK 39 gun: the Panzer III J1 provides a better punch. This variant, compared to its predecessor - Pz.III J, features only few, but very important upgrades. 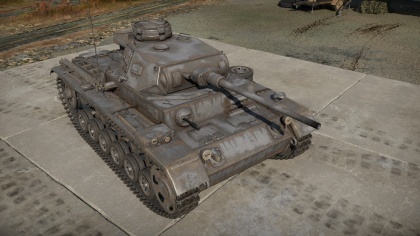 The second important upgrade is the electric turret drive - greatly improving the turret traverse speed, and removing the long present weakness of all older Panzer III variants. Optimal combat distance for this vehicle is somewhere between medium to close range. But don't be mistaken, the Panzer III J1 is not an frontline tank. You should be always on the move and harass the enemy without rest as any return fire will be lethal. Don't trust your armour and instead rely on your mobility. Flanking is the best option for J1 as you can use the high RoF for good effect and hopefully avoid the incoming retribution. You don't have the best mobility for a medium tank, but you definitely remain competitive against most enemy tanks you may encounter. Always try to find some good firing positions, with available cover, and if necessary, pull back and relocate. Always avoid direct close range confrontations with main enemy force; never try to fight more than 1 enemy at the time. However - playing purely as support/sniper tank isn't optimal either, because of your lower armour penetration. PzGr 39 - Armour Piercing Capped shell - This is your main ammo type, use it whenever you think it has enough penetration to penetrate your target. It deals the most damage because of its explosive filler. PzGr 40/1 - Armour Piercing Composite Rigid shell - This type of ammo should be used if you are having trouble penetrating your opponent, or trying to hit a fast moving tank at some distance. However, its damaging potential is much lower, because it has no explosive filler to further enhance damage after the penetration. PzGr 40 - Armour Piercing Composite Rigid shell - this variation of APCR is lighter, slightly faster and offers the best penetration (up to 150mm). Use it against heavily armoured beasts like the KV-1 (If you can't flank them). However, don't expect it to cause any real damage upon penetration, it is even worse than that of PzGr 40/1. It basically only deals damage to modules/crew straight in its path. It is therefore almost useless to fire them at things like turret cupolas, as it will usually just fly right through them. SprGr 38 - High Explosive ammo - You should carry only very few of these. They are completely useless against anything other than unarmoured AA vehicles, to which it is lethal. Ammo racks of the Panzer III J1. First of all, lets talk about the gun. The 5 cm KwK 39 is a good gun in the right circumstances. Its main round, the PzGr 39 Armour Piercing Capped has average penetration for the BR, but causes little post penetration damage. 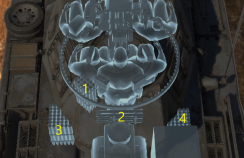 Granted, if you fire it into a tightly packed turret, it will knock out the crew, but larger vehicles can be an issue. Then, there is the PzGr 40 Armour Piercing Composite Rigid (APCR) round, which has high penetration (150mm!) and can engage anything at its BR but causes very little internal damage and performs poorly against sloped armour. It also loses its penetration quickly at range. It is best to carry both of these types of ammunition, allowing you to combat different targets more effectively. Luckily, the KwK 39 has a saving grace. With a reload time of just under 5 seconds, it fires very quickly. This gun performs effectively in flanking maneuvers, where you can take advantage of weak side armour. Precise aim is necessary, as this gun rarely destroys a target in one shot. Normally you have a choice. Do you shoot the driver and immobilize the tank and then incapacitate the gunners? Or do you knock out the gunners first and then take out the driver? Most of the time, it is best to take out the gunners first, so that the tank cannot shoot back. However, if the tank is mobile and the turret is facing another direction, it is sometimes best to take out the driver first. This way the tank won't have a chance to find cover. This is always the best strategy against turretless SPGs, as immobilizing the vehicle by taking out the driver, transmission, or engine will incapacitate the tank if it is not facing you and guarantees an easy target for follow-up shots. The armour of the Panzer III is poor. It is flat, and at 50 mm it won't protect you from even rank 1 guns. From the sides you are vulnerable to anything above a .50 cal machine gun. Avoid frontal engagements with M4 Shermans and T-34s. You are unlikely to be able to destroy them quickly, and often your rounds will ricochet off their sloped armour. Their rounds will slice through your armour like butter and often knock out your entire crew after a single penetration. Thus, this tank is best used as a flanker, using your decent speed and high fire rate to unload shell after shell into vulnerable side armor and hope for the best. Gun lacks penetration at range, is likely to bounce from slopes, and isn't very accurate. APCR is pathetic at long ranges and deals very little damage upon penetration. The Panzerkampfwagen III medium tank, or the Panzer III was developed in the 1930s. Starting in early 1934, Heinz Guderian set down some specifications for a new tank, which the Army Weapons Department took up to design the tank to weigh no more than 24,000 kilograms with a top speed of 35 km per hour. This tank's role was to be the main tank of the German army and was expected to destroy opposing tanks, as opposed to a tank made to destroy anti-tank guns and opposing infantrymen, which the Panzer IV served as. Daimler-Benz, Krupp, MAN, and Rheinmetall produced prototypes meeting the specifications and the Daimler-Benz model was chosen after testing in 1936-1937. The Panzer III model used a leaf-spring suspension in its early models (Ausf. A - Ausf. D) before utilizing a six-wheeled torsion-bar suspension in the Ausf. E and beyond. The Panzer III had a crew of five men, the commander, gunner, loader, driver, and assistant driver. The best feature of the Panzer III during its introduction that is the most overlooked was the three-man turret, which was not as common at the time. This frees the commander to be able to effectively command the tank while maintaining situational awareness, rather than be burdened by the role of a loader or gunner, improving combat effectiveness of the tank. The 37 mm (later 50 mm) anti-tank gun was also very effective against contemporary tanks. Despite this rather advanced design, the turret did not have a turret basket for the crew. It was a proven design and production began in May 1937. The total number of Panzer III tanks constructed in its production life was 5,774 units (excluding the far more produced StuG III variant). The Panzer III Ausf. J1 features a much better 50 mm gun compared to its predecessors, the 50 mm KwK 39, which is an improvement over the 50 mm KwK 38 by its longer barrel that provided additonal accuracy. Longer cartridges with more propellant charge were used, providing extra velocity and penetration. This new 50 mm gun gives the Panzer III a fighting edge against T-34s and M4 Shermans, which the older 50 mm KwK 38 had trouble fighting against. The Panzer III Ausf. J1 still featured the 50 mm armour thickness on the front and rear originally from the Ausf. J variant, but later models had new offset armour on the front of the hull and turret that provide 20 mm of effective protection These armour also apply as spaced armour due to not being attached to the hull or turret mantlet. The spaced armour on the front helped defend the tank against Soviet anti-tank rounds or HEAT rounds fired at it on those plates, as it dissipates the penetration power before striking the hull. The Panzer III J1 was only a stopgap design to integrate the 50 mm KwK 39 into service as fast as possible. The final designs in its later models were later redesignated the Panzer III Ausf. L and Panzer III Ausf. M. It saw service on the eastern front, where it performed poorly against superior T-34 and KV-1 tanks. However, it also saw service in North Africa, where it would easily defeat allied light tanks such as the M3 Stuart and the Crusader, even when outnumbered. However, the introduction of more medium tanks by the allies in the African theater would prove to be problematic for the Panzer III. Those that survived the defeat in Africa would try to defend Sicily from the allied invasion of Italy. Skins and camouflages for the Panzer III Ausf. J1 from live.warthunder.com. There are plenty of category terms flying around. So looking through every one of them will be necessary. Some of these might not work. 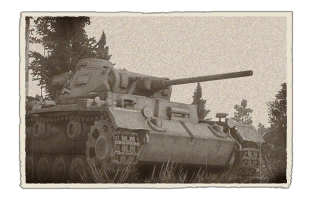 Look for the Panzer 3 tanks with the very long barrel, or see what the description says.